An American man was trying to reverse his caravan into the driveway of his home in Brockton, Massachusetts on Wednesday when something went wrong. 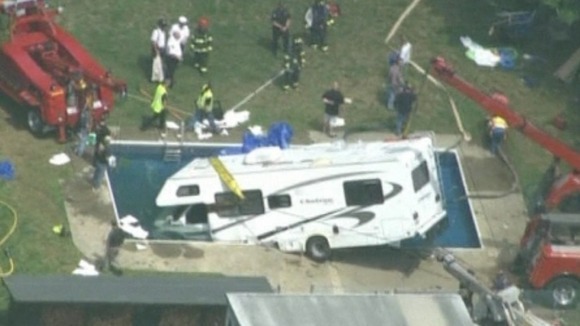 Seconds later the 30-foot vehicle was lying nose-down in his neighbour’s swimming pool, the cabin filling with water. The neighbour, Norman Little, was walking into his garden just as the caravan came careering through the fence. He was able to pull the driver, Stephen Pierro, out of the water and to safety. In this situation it’s essential to have an motorhome insurance policy! Mr Pierro said there had been a problem with the accelerator and that his foot had become stuck. Another possible explanation is that Mr Pierro, who is diabetic, may have had a medical lapse.